Aztec pattern wristlet. When you are on the run and don’t want a huge bag, a small and neat wristlet pouch is the answer. Staying on-trend with the tribal fad, this exquisite bag features an Aztec print design in a lovely blue-green color with striking black geometric shapes. Capture the allure of an ancient civilization steeped in mystery, history and tradition. 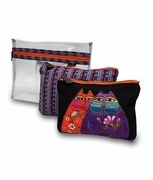 The pouch has a secure top zipper and one compartment. Attached to the side is a leather-look wristlet strap for slipping over your arm. 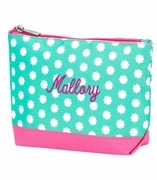 This pouch can be paired with our full-size tote search item PCR-RVC1506 morning sky in the same design where it can be slipped inside as an accessory bag. The tote and wristlet combination make a great gift for any lady who appreciates style.